Image from "Applying Intel® Optane™ SSDs to MySQL- Part 1: Fast Storage" by Ken LeTourneau at Intel. 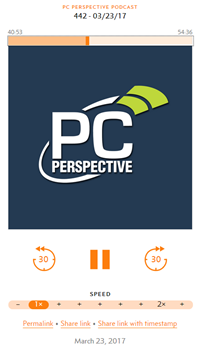 Allyn Malventano discusses 3D XPoint technology and Optane implementation on PC Perspective podcast 442, Mar. 23 2017.
along with the detailed specifications and product brief. Initially available PCIe storage form, seemingly not available anywhere for pre-order quite yet, with the press release starting "available now to customers in an early ship program." The first 375GB version has been reported to weigh in at an MSRP of $1520. 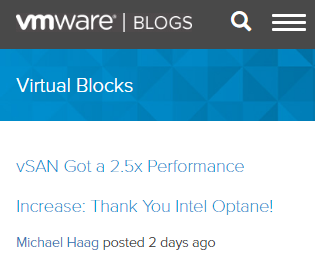 I started talking about Optane and 3D XPoint way back in December of 2015, again in February of 2016, and again last month. I also explained that XPoint Storage Accelerator arrives in Kaby Lake ThinkPads in early 2017 as a really fast 16GB NVMe cache for its Intel RST RAID volume. 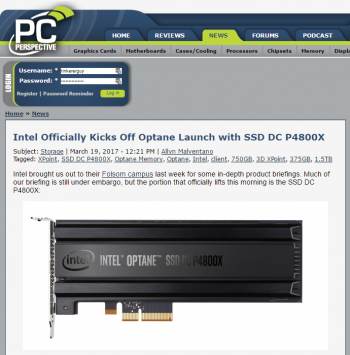 What does this P4800X arrival mean for PCIe 3.0 equipped systems today? It should work great as an ultra fast SSD, for multi-user environments such as a shared NTFS in Windows or VMFS in VMware, where high queue depths and low latencies work wonders, as I explain here. Also, one heck of a MySQL performer, see also my interview with the Intel author of that article, Ken LeTourneau. What does this P4800X arrival mean for the ESXi hypervisor today, as far as vSAN is concerned? Ah, that one is easy. When you're talking about using Optane as a wicked fast PCIe based storage device rather than some sort of memory device, folks lucky enough to have one can stick it right into their systems and use it, even when the PCIe slot only has room for a HHHL AIC, a Half Height Half Length Add In Card. Yes, that means it could fit into my TinkerTry'd Supermicro SuperServer Bundle 2, to be used as a storage device. Back to the real world for a minute, the enterprise, where inclusion on VMware's HCL (Hardware Compatibility Guide) and VCL (vSAN Compatibilty Guide) is required. Very reassuring that VMware is right there with Intel for vSAN, on the day-and-date of announce! What could this mean for a hypervisor that needs more RAM? Well, it's RHEL and SLES only. Period. Details are a little scant, but the Product Brief fills in some of what we need to know, that for now, it's RHEL and SLES only, and only with the BIOS in non-UEFI mode, which rules out secure boot. No VMware ESXi or Hyper-V. Sigh, but not too surprising. Intel RSTe (software RAID) never worked with VMware either. Only Core i7 listed, on this logo page. We will need to learn more about exactly how this extra-cost license for Intel Memory Drive Techology will actually be implemented. There's also the inevitable questions about whether current generation Xeon D and Xeon E will ever be supported for use as RAM, very unlikely. I should disclose that I have not been officially or unofficially briefed by Intel. Everything in this article is simply going off of publicly available information. 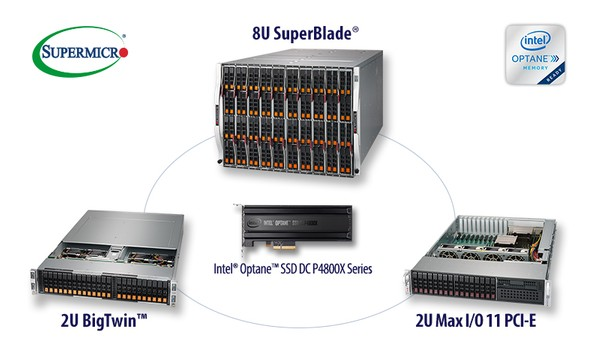 Note what happened at Cebit today, Supermicro Launches New Intel Optane SSD Optimized Platforms. I'll be with Supermicro presenting at the NYC VMUG this Thursday March 23rd actually, perhaps I can get some more then. Stay tuned! 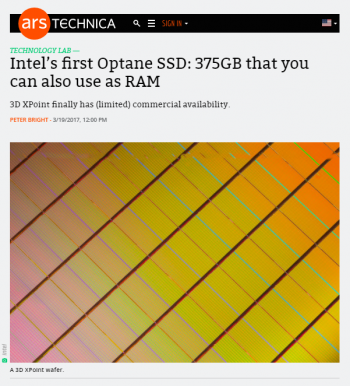 Recent press about the Intel Optane SSD DC P4800X Series, with short excerpts that I feel are the most tantalizing bits for the virtualization enthusiasts. Enjoy! The combination of vSAN and Intel’s Optane technology provides an optimal solution for a digital enterprise looking for the highest performance in all-flash storage and software-defined infrastructure (SDI). Thanks to the agile nature of vSAN and support for the broadest choice of hardware platforms, vSAN customers will be able to immediately take advantage of the performance and reliability benefits of the Optane SSD—no need to wait for the typical hardware refresh cycle of a traditional storage platform. With the shipping product, these comparisons are now clearer, as one of Intel's slides make clear: 3D XPoint has about one thousandth the latency of NAND flash (or about ten times the latency of DRAM), and tens times the density of DRAM. The low latency and high endurance make Optane a good fit for applications like caching and database servers. 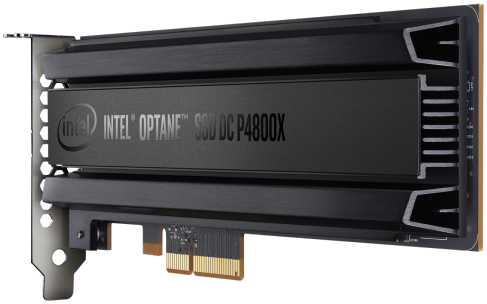 But taking further advantage of these two properties, Intel has developed a new way of using Optane. The P4800X can be used as a regular PCIe attached SSD, but Intel has developed something it calls "Memory Drive Technology" that allows the P4800X, when used in conjunction with an appropriate chipset and processor (which means you'll have to use a Xeon processor), can be used as if it were RAM. If using the PCIe bus to attach storage and then use it as memory seems a bit awkward, next year Intel plans to release Optane DIMMS. Intel is offering the 375GB P4800X in PCIe add-in card form factor with a MSRP of $1520 starting today with a limited early-ship program. In Q2 a 375GB U.2 model will ship, as well as a 750GB add-in card. In the second half of the year the rest of the capacity and form factor options will be available. The full licensing cost structure for Intel Memory Drive Technology is not clear, but the MSRP for a 375GB P4800X bundled with Memory Drive Technology is $1951 compared to $1520 for the SSD alone. The Memory Drive Technology hypervisor must be booted from a USB device or an IDE-compatible storage controller, and the guest operating system cannot be booted in UEFI mode. 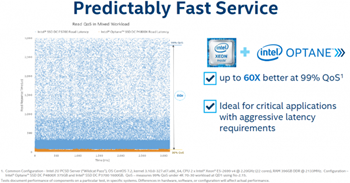 Intel Xeon E5-x6xx v2 or later and E7- x8xx v2 or later processors are supported. Future 3D XPoint-based Optane products on Intel's roadmap include Optane Memory cache drives for the client/consumer segment, due in Q2 of this year. They will also be followed by larger Optane SSDs for the client market. DIMMs featuring 3D XPoint memory are planned for 2018. Even with the Optane SSD connected to the PCIe bus, the unique latency and QoS characteristics allow the SSD to be well suited as a Memory device. There are multiple ways to do so, starting from typical OS paging, going down to app-based accelerations. We support any of those directions, but also introduced something special – Intel® Memory Drive Technology. It’s a software middle layer, which runs below OS and converts SSDs into a memory. When you pair this software with an Intel Optane SSD and some system DRAM, the combination is presented up to the Operating system as a single memory pool, transparent to the OS and applications. With Intel® Memory Drive Technology and Optane it runs at 112% of DRAM performance. Which means its a great fit for servers that need a lot of addressable memory, like RAM, without spending a lot of extra cash on 64 and 128GB DIMMs, which are insanely expensive. It’s not quite as fast as memory, but in a lot of data center situations, the increased speed is enough to come close, depending on the workload. In these situations, latency becomes a major factor, and that’s another area where the PC 4800X excels. Not only is the latency much lower as stress levels rise, but it’s also more consistent, an added bonus for the people who need to keep these servers running. Virtual SAN Powered by Intel® Solid State Drives. 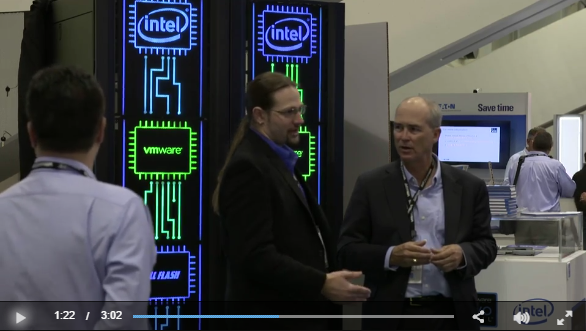 A demo of a 64-node, 368 Terabyte Virtual SAN powered by Intel® SSDs, including the Intel® SSD DC P3700 Series and the Intel® SSD DC S3510 Series. A strong case made for an all-flash Virtual SAN to support VMware Vsphere. Mar 19 2017 by Allyn Malventano. On this recent particularly interesting PC Perspective Podcast, Allyn Malventano discussion about the DC P4800X Series is summarized/paraphrased here. Enterprise product, no consumer version yet. Non-volitile memory, but not flash memory, some sort of phase change memory that goes way faster than flash, without the limitations on how you do writes with flash memory. It's able to write stuff in place at the byte level, without the need to shuffle stuff around. Behaves much more like RAM, currently at about 1/10th the speed because currently has to pass through NVMe and PCIe, since it's not in the DIMM slot. As the conversation goes on, important for me to get every word verbatim. There's some info about VMware and Intel Memory Drive Technology as well, I'll try to get some clarification on that. Here you go, a transcript/excerpt, to convince you it's worth subscribing to the podcast, and/or supporting PC Perspective on Patreon. There's 3D XPoint and then there's Optane, XPoint is the technology at the chip level, Optane is the implementation of the techonology on a product level through at this point PCIe, which has its bottlenecks. So this thing is not meant to be the thing that replaces flash...you're not going to replace those 4TB of flash with 4TB of this...primarily because of cost...however...it would make a pretty mean caching layer. The P4800X is a product that will exist in an add in card, as well as in a 2.5" U.2 drive. It's primarily aimed at 2 implementations. One is to expand your memory footprint, and the other is to cache your SSDs...Depending on which method you go with is very dependent on what your workload is. If your workload would benefit from more memory, but you don't want to spend because memory is still signficantly more expensive than what this is, especially when you get into the high rank densities, this is an option for that. You could have a server that you wanted an entire 1/2TB database sitting in RAM because you just needed it to go that quickly, instead of having to buy 1/2 or 3/4 of a terabyte of RAM and put it in the server, this despite the fact that it's like $4 a gig, still way cheaper. The DIMM implementation of Optane...that would be faster than this...they ran into some hiccups with this, and complications, that's why they're leading with this. And they had other people up there talking, and they had you know VMware like uh ESXi 6.5 has support for it built in already now. It's aware that it is a faster tier than flash, and it can use it accordingly if you just bascially point it to that thing that's plugged into the system, so in other words you don't have to completely reconfigure your VMware Server infrastructure, you just kind of add this thing, it can speed stuff up for you. For the majority of our audience, we're kind of waiting for what the consumer version of this will be. At the event, they said there will be a consumer version of it...at the end of my post, I decided to do a history lesson. 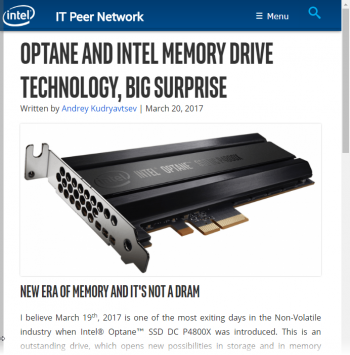 All Optane or 3D XPoint mentions at TinkerTry.